Sometimes it’s just easier to cook the whole darn bird. At least that’s what I figured would be easiest for our Easter dinner. [Yes, I know, this post is wildly late.] 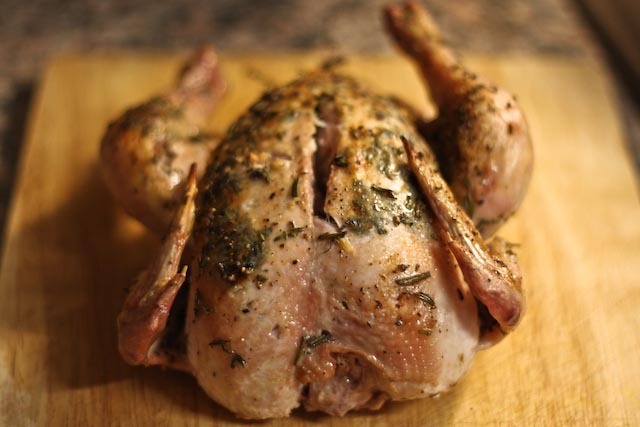 I’ve never roasted a whole chicken – or turkey! – before, and I figured it was high time to give it a try. Plus, buying a whole fresh chicken from the grocery store here is quite inexpensive, and who couldn’t get on board with that!? 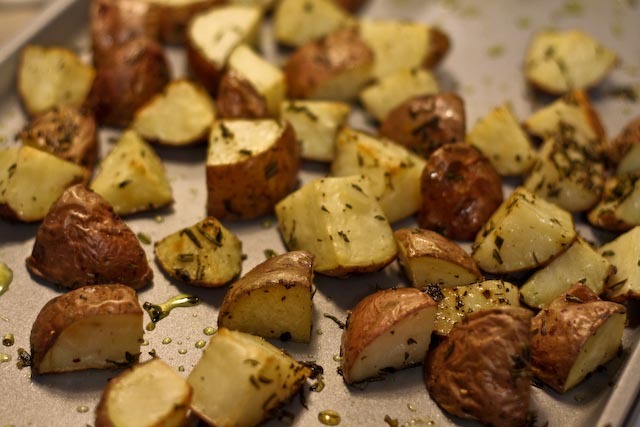 I don’t have pictures of the process (my hands were a bit covered in butter and herbs, but I’ve tried to described the process in the recipe below. I roasted the chicken in a large ceramic baking dish on a bed of onions, carrots, and garlic slices. They give great flavor to the chicken and make a terrific side dish to go alongside the chicken. 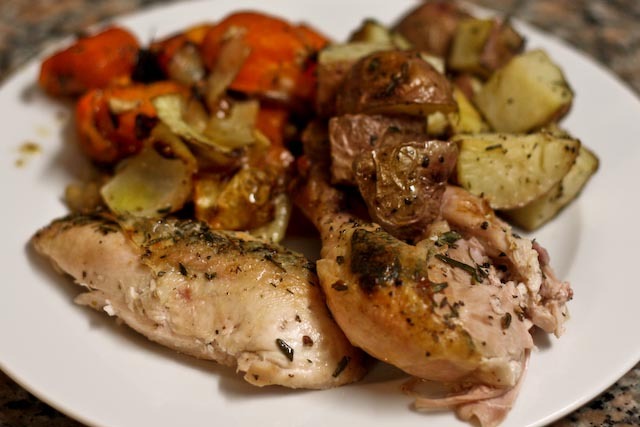 In addition to the carrots and onions, I served the chicken alongside roasted red potatoes tossed in olive oil. Yum! Ta da – a feast! And it’s extremely easy to put together. All you need is a chicken, a little softened butter, and some fresh herbs. Preheat oven to 425F°. Drizzle a large, deep-sided glass or ceramic baking dish with olive oil. Add pieces of carrots, onions, and garlic in an even layer on the bottom of the dish. Place the chicken on a cutting board. Lift up the skin and using your fingers, smear a bit of butter under the skin. Spread a pinch of each of the herbs under the skin and spread over the bird. 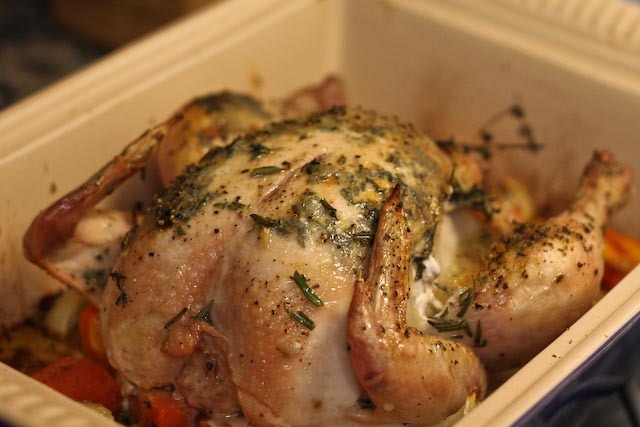 Coat as much of the chicken as possible with a thin layer of butter and herbs while maintaining the skin in tact. Sprinkle the rest of the herbs over the top of the chicken. Drizzle with olive oil and season liberally with salt and pepper. Place the chicken in the baking dish and on top of the vegetables. [Note: you can truss the chicken legs together with kitchen twine, if you like, but it is not necessary]. Tent with aluminum foil. Bake at 425°F for 15 minutes, then reduce heat to 350°F and bake for another 30 minutes. Remove foil, toss carrots and onions with tongs, and bake for another 15-20 minutes until the juices run clear when a knife is inserted between a leg and thigh or an instant-read thermometer inserted into the breast reaches 160°F. 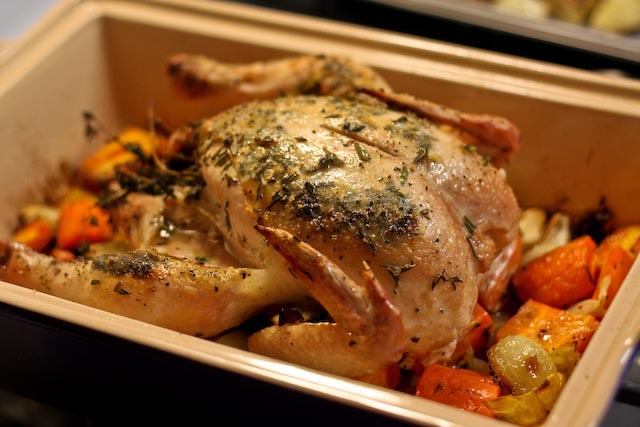 Remove from the oven and allow to rest on a cutting board for at least 10 minutes before carving. Serve with the vegetables.